Preheat oven to 200°C/180°C Fan/Gas Mark 6. Peel and cut the potatoes in half and simmer in salted water until just tender. Meanwhile make the cheese sauce. Pour cold milk into a small pan, add flour and butter, heat gently stirring continuously until the sauce thickens. Add the Applewood®, season and set aside. Cut the fish into bite-size pieces and place in a large bowl. Add prawns, cornichons, capers, and parsley. 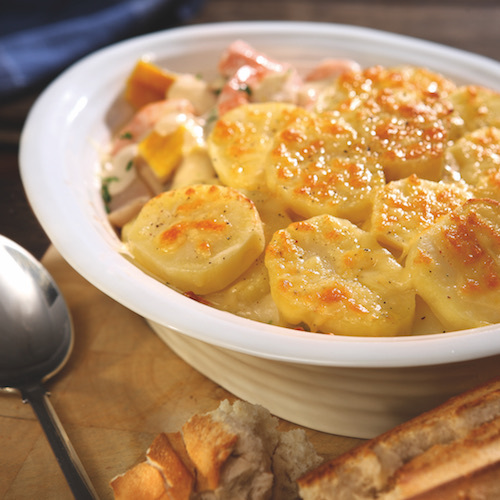 Stir in cheese sauce and then carefully transfer the fish mixture into a large ovenproof dish. When potatoes are cooked, drain and allow to cool until cool enough to handle. Cut each potato into thick slices. Arrange over the fish mixture and sprinkle over the grated Applewood®. Bake for 25-30 minutes until the fish is cooked and the top is golden brown.